I have been living in Brixton for over 35 years and have seen the transformation from the mid 80’s to today. I have gotten involved in some of the historical events and also chosen not to subscribe to others which in my opinion never built cohesion with the community. I have heard a lot regarding the Brixton Green initiative but did not quite see where the direction of the organisation was heading in those early days however, over the last couple of years I have seen a change with more focus on helping the community of Brixton and the passion for the people who live and work in the area. I too have campaigned and championed community driven projects but took a back stage. I need to be more involved and the Brixton Green and Somerleyton Trust agenda seems to be aligned and also passionate for community led growth. I have seen the current leadership and local government (Lambeth & TFL as examples) ignore community leaders, focus groups and campaigners and focus on the profit and purse strings, yet we see no real improvement for the community. I have actually seen a decrease in community cohesion however an increase in visitation which has been built on the back of community here in Brixton and also the diverse cultures, community spirit, and vibe in Brixton. The market no longer exists but there are flocks of people coming into Brixton to invest in the market and the community based business run by local Brixtonians. I have seen business rates increased and closing, forcing out the very businesses keeping the Brixton community alive. Social housing has been drastically reduced forcing families and communities to leave. Private landlords pricing out social housing tenants, gentrification corrupting the very place which has drawn other communities to Brixton. I wish to make a stand, what can I bring, well, local knowledge and experience in and around Brixton. I am a very capable communicator. I have some experience within the housing and also charity sectors and I also mentor youth in the Brixton area (for Free). I’ve lived in Brixton since 1985, apart from two years in Nigeria as a V.S.O. volunteer from 2004 to 2006. I originally trained and worked as a computer programmer, before volunteering with V.S.O. Since returning to the U.K. I have worked as a S.T.E.M. educator at an adventure playground and youth centre in Lambeth, and have volunteered with Into University and Your Story. Although I don’t have children, I taught a children’s martial arts class in Shorinji Kempo at Brixton Recreation Centre from 1993 to 2004. I became interested in children’s development, and in education, both for children and adults. I was fortunate to be able to buy a house in London, at a time when homes were affordable. The current situation is both unfair, and unsustainable to young people, especially those that want to have children. I became interested in local politics in 2015, and joined the Green Party. I am also part of the “peoples audit” team, which is non-political, and looks at financial management by Lambeth Council. I have worked in various organisations, from large corporations such as Sony, to small charities. I would like to use my knowledge and experience to keep the diversity that we have in Brixton, and help to create affordable housing. I am a local mum of twin girls with a keen interest in community development, the Arts and creative learning. I’ve lived in Brixton for 25 years and worked mainly as a community artist/manager and was involved with original Brixton Splash festival – firstly as a Trustee and then by coordinating their outreach and education programme. 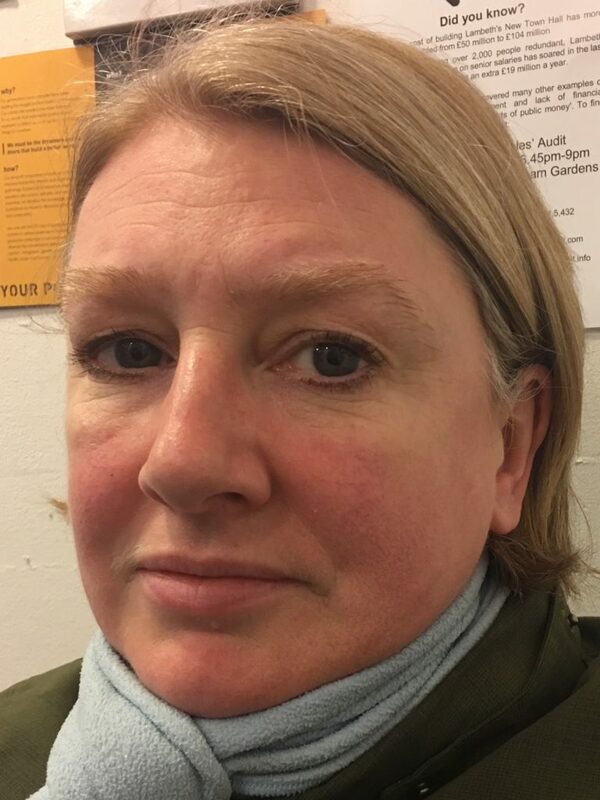 I was a parent Governor at Hill Mead primary school on the Moorlands estate and now manage Brixton Community Base – an arts orientated community centre on Talma Road. I’m a Community Connector volunteer (a Lambeth-wide NHS funded health and wellbeing support initiative). As a single mother in privately rented accommodation, I am extremely worried about the future. My family live in a one bedroom flat and are very vulnerable to any rent increases. I’m aware that I may have to uproot my family from London at a month’s notice, disrupting their education, severing ties with friends and neighbours, and threatening our financial viability, as I would lose my job. I was one of the first members of Brixton Green, as I strongly believe in its values of local expertise, community control and accountability. I can offer my local knowledge, and by utilising my extensive networks in Brixton, can facilitate conversations to access grassroots support and resources.